EUC MISS ME Capri Jeans Size 30 Wow! Well kept, ready for wear. This Jeans Is In Excellent Condition With Minimal Evidence Of Wear. This Are The Actual Picture From The Item. 100% Authentic. NOTE: MISSING RIVET ON THE BACK LABEL AND STONE ON THE LEFT BACK POCKET. WAIST: 14.5", RISE: 7.5", INSEAM: 32", LEG OPENING: 8.5", APROX. USED IN VERY GOOD CONDITION, NORMAL USE. 30" true waist measured x 32.5" inseam-.99NR! 73% COTTON / 25% POLYESTER / 2% ELASTANE. COLOR :DK 52C. Doesn't fit?. Don't like it?. No problem. Miss Me Bootcut Jeans size 29. Distressed style. Waist measured across the front is 15”, Rise is 7 1/2'', Inseam 32 and leg opening is 17''. 98% cotton and,2% spandex. The jeans are in good shape. On the front jean button needs a little repair. This would be a great buy for anyone good at sewing. Item will ship date of purchase. Miss Me Jeans Size 28 Bootcut. Condition is Pre-owned. Shipped with USPS Priority Mail. Like new. Embellished w/lace inserts. Dark denim. 33 inseam. Will gladly combine shipping on mult items purchased. Non smoking home. Skinny Style #JP7126S. Skinny leg. Classic five-pocket styling; embroidered back pockets. Light blue wash with blasting and whiskering. Cotton/elastane. Zipper and button closure. 98% COTTON / 2% ELASTANE. STYLE: JP5908BV. miss me jeans 29 bootcut. Condition is Pre-owned. Shipped with USPS Priority Mail. MISS ME Women’s Size 26 Boot Jean's Embellished SEQUIN Pockets NWOT. Shipped with USPS Priority Mail. The zipper slides down very easily, so I'm unsure if it will stay up. And I just noticed that the front crotch area has been repaired (see photo.). 32" true waist measured x 25" cropped inseam-.99NR! Leg Opening 9. 98%Cotton,2%Spandex / Elastane. Across waist 15. Missing 4 studs on logo patch near red dot (see photo #7). I WILL TRY TO HELP TO THE BEST OF MY ABILITIES. NO EXCEPTIONS. miss me jeans 27 bootcut. Shipped with USPS Priority Mail. Gorgeous embellished flap back pockets! Holes in Legs. Stitching as accents on pockets. Embellished pockets. Length 39.5". Inseam 31". Condition: GOOD USED CONDITION NO STAINS. THERE IS A HOLE ON BOTH BACK POCKETS BUT I BELIEVE THE PANTS WERE MADE THAT WAY. I AM A SMOKER BUT DO NOT SMOKE IN THE HOUSE. SORRY FOR THE INCONVENIENCE. Miss Me Jeans- Size 26. 30 inch inseam. Condition is Pre-owned. Shipped with USPS Priority Mail. Miss Me Women’s Signature Straight Denim Jeans SIZE 30. Condition is Pre-owned. Shipped with USPS Priority Mail. 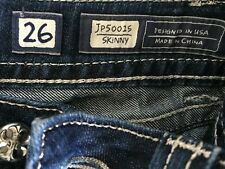 Miss Me Jeans Sz 26. Condition is Pre-owned. Shipped with USPS Priority Mail. Georgeous Po ck et s fe at ur es B ro nz e Bl ue c ol or s an d Rhinestones. These jeans are pre-owned and are in used condition. Minor wrinkling, lint, loose threads, and light smudging is present. The button and zipper are in working order. See photos. Sold as is. Style / Marked Size : Signature Boot Cut Jeans / 29. EUC MISS ME Capri Jeans Size 30 Wow! . Condition is Pre-owned. Shipped with USPS Priority Mail. 8” rise ( I think they are low rise) 24” inseam. Smoke free home. These jeans are in excellent condition. In GREAT USED CONDITION as you can see in the photos. If There Are Any Unforeseen Issues. LOOK at photos . Miss Me is a clothing company that offers women many different types of jeans. Their pants are available in diverse colors and hues and include various forms of embellishments. From skinny to straight and boot cut, any woman can find pants that fit their style. What style of skinny jeans does Miss Me have? The company has a variety of skinny jeans in different lengths, hues, and styles. The Distressed To Impress jeans have a punk look. The ankle-length designs feature faux holes and appear to have plaid leggings underneath. The Cuff It Out Mid-Rise jeans are a dark blue hue and are embellished with rhinestones. The All In Stride jeans have a faded look. What styles are Miss Me women's jeans available in? Miss Me has 13 different looks. A few include abstract, floral, wings, and cross. Abstract jeans have designs such as diamonds and triangles. With the floral look, bottoms are sparsely decorated with flowers. Wing jeans are embroidered with a pair of winged angel feathers. Each cross style jean has a cross embroidered on the back pockets. Does Miss Me have white jeans? The Moto Maven mid-rise skinny jeans are a solid white. They are made entirely from cotton and feature zipper accents. The Moto Maven also has pin tuck details on the knees, tonal stitching, and a hem that stops just above the ankle. What styles are boot cut jeans offered in? Boot cut jeans are available in lighter and darker hues. The Feather or Not are a medium blue. The seams are white, and so are the feathers that are embroidered on it. Spellbinder is a black pair of jeans. The Show Stopper is a faded color. It features five pockets and faux holes. Don't Cross Me is a medium blue color with fading in the buttock region. What kind of capris does the company have? Many of Miss Me capris have embellishments or faded looks. The Cloud Nine Boyfriend is all cotton, and features shredded holes on the front and back as well as a cuffed hem. Spring It On has a frayed cuff hem. Flowery embellishments are added at the back pockets and along the hem. The Shifted Energy is faded and has a chevron pattern along its waistband. It features frayed trimming and decorative stitching on each pocket. What materials are Miss Me jeans made from? They are made from three different materials: cotton, polyester, and elastane. Some bottoms, such as the Rebel At Heart, are made mostly from cotton. Cotton allows Miss Me Jeans to be strong, durable, and able to withstand being washed repeatedly in hot water. Many of the jeans contain elastane, which helps them to be more comfortable and more breathable. The All That Sparkles skinny jeans and others contain polyester. Polyester has flexible, durable fibers that are resistant to shrinkage and wrinkles, so jeans keep their fresh, new look longer. For everything she is and all that she's helped you to be, buy gifts like Miss Me jeans and show your mom you love her this Mother’s Day. 2XSXSSMLXL2XL000246810121416202223 in.24 in.25 in.26 in.27 in.28 in.29 in.30 in.31 in.32 in.33 in. PPPXSPSPM0P4P12P14P16P24P26P23 in.24 in.25 in.26 in.27 in.28 in.29 in.30 in.31 in. 3X24W26W28W30W32W34W38W32 in.33 in.34 in.36 in.39 in. XSSML0013579111323 in.24 in.25 in.26 in.27 in.28 in.29 in.30 in.31 in.32 in. SML4 Tall12 Tall14 Tall26 Tall28 Tall30 Tall34 Tall24 in.25 in.26 in.27 in.28 in.29 in.30 in.31 in.34 in.